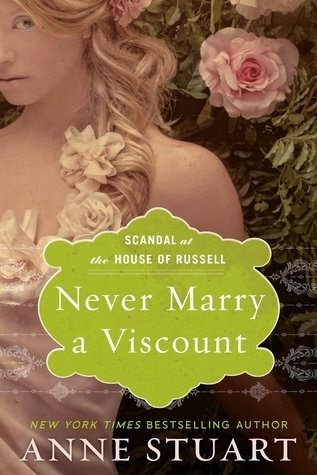 Never Marry a Viscount by Anne Stuart. This is book 3 in the Scandal at the House of Russell. After her family is disgraced when her father ruins his business and commits suicide, Sophie Russell wants to follow in her sister's footsteps and find the the person who is truly responsible for their downfall. She and her sisters know that their father didn't do what they say he did. Her sisters have gone after two of their suspects, which leaves the third, Viscount Griffiths, for Sophie. When she goes to the Viscount's home looking for a way in, she finds that they are in need of a cook. Having a love of cooking, she steps right into the position. Viscount Griffiths, Alexander, is expecting a courtesan to arrive any day. So when Sophie arrives and acts like his new cook, he thinks that this is a cover story to explain why his new mistress is in him home. He can't figure out why she keeps during down is attempts of seduction when he is paying her to be at his beck and call in the bedroom. 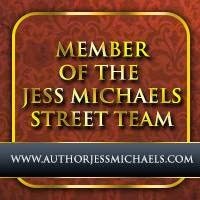 Even though Sophie is still trying to find evidence that Alexander framed her father, she can't help but think the man she has come to know is innocent. As their attraction for each other grows, will Sophie ever learn the truth? I really enjoyed this book and the series it is a part of. This story could be read as a stand alone, but I think it would be much more enjoyable to read the three books in the series. You are able to see how the villain interacts will all three sisters. So one of my favorite parts of the story is that before ever going into Alexander's home she has been spying on him as we goes for his daily swim. This is so contrary to how a "lady" should behave during this time period, that it quite livened up the story. I love that the author had the servants figure out who Sophie was from the beginning and that they tried to protect her from being found out and Alexander's advances. I was laughing out loud at their antics. This is definitely a series that you should put on your TBR list! Thanks go out to Montlake Romance for a copy of the book in exchange of an honest review.